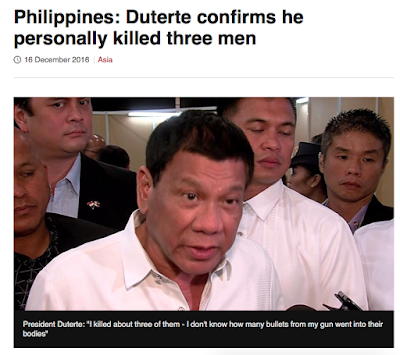 Philippinefails: Why is Duterte so Mad? In a remarkable display of tact and restraint President Duterte kindly asked the New York Times to please refrain from publishing wrongful opinion pieces about him. “Well, it’s about time that their publication also must stop,” Duterte told reporters in an ambush interview in Malacañang on Thursday. The New York Times recently published an editorial piece titled "Let the World Condemn Duterte." The writer of this article details the recent compliant filed in the ICC by Jude Josue Sabio. The lawyer, Jude Josue Sabio, filed the complaint in his own name, but he also represents two men who have publicly said they were paid members of the death squad that Mr. Duterte set up in Davao City when he was the mayor to hunt down drug dealers. This is a man who must be stopped. So what is Duterte mad about? Is he mad that the NYT and others continue to link him to the Davao Death Sqauds? In an interview in the local television program “Gikan sa Masa, Para sa Masa” which aired on Sunday, Duterte admitted his link to the infamous Davao Death Squad (DDS). “They say I am the death squad? True, that is true,” Duterte said. Duterte, who is tied with Interior Secretary Mar Roxas in third place in the recent Social Weather Stations electoral survey, warned that the number of dead crime suspects would shoot up to 100,000 if he got elected. “If by chance, God will place me there, the 1,000 will become 100,000,” he said. “Diyan mo makita na tataba ang isda sa Manila Bay. Diyan ko kayo itatapon (You will see bigger fish in Manila Bay because that is where I will dump your bodies),” he added. “I do not want to be president. 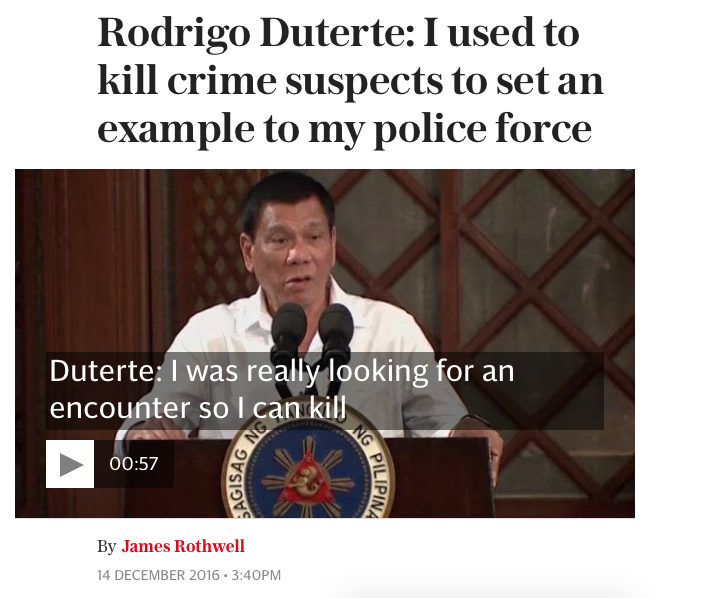 I do not want to kill people so do not elect me as president,” Duterte said. “Papatayin ko talaga kayo (I will kill you),” he stressed, referring to criminals. “I will kill all of you who make the lives of Filipinos miserable. I won because of the breakdown in law and order,” he said. He admitted with his own mouth that he was involved with the DDS. He said he did not want to become president because he did not want to kill more people. To all the criminals listening he said, "I will kill you!" HAHAHAHA so funny right? 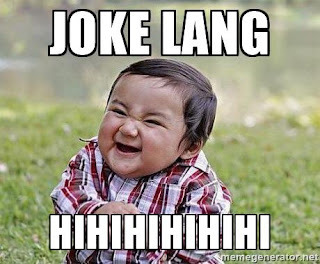 Joke lang!! 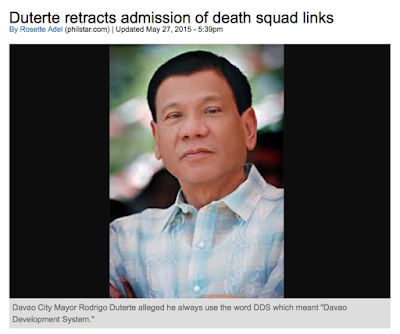 When he said DDS he really meant Davao Development System not Davao Death Squad. "Ako, ako daw death squad? True, that's true," he said in an interview with Gikan sa Masa Para sa Masa. So what is Duterte mad about? He has admitted to being connected with the Davao Death Squad. He has admitted to the BBC that he killed three men. He has admitted that he drove around on his motorcycle looking for criminals to kill in order to set an example for the police to follow. 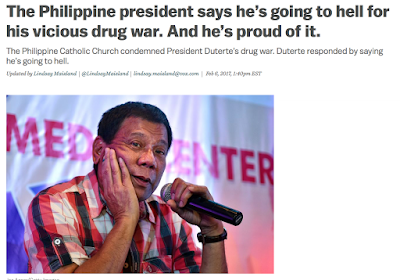 He has admitted he is going to hell for the vicious war on drugs. 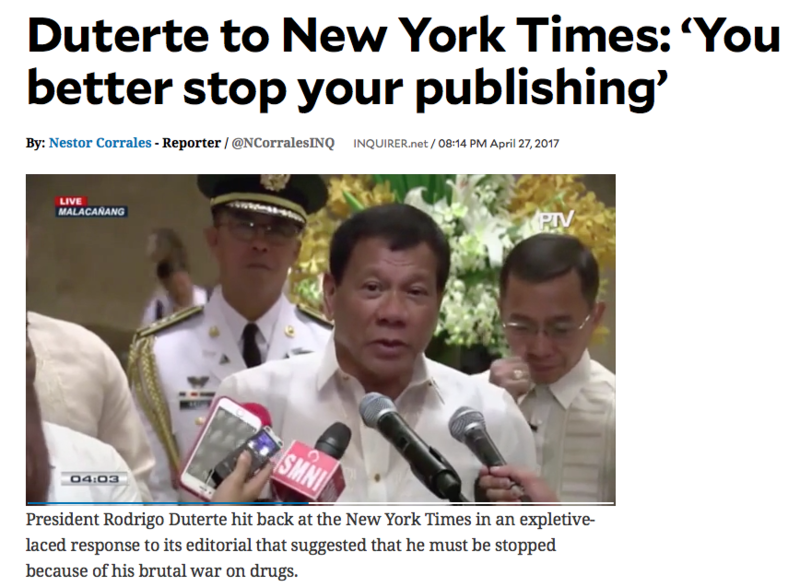 After all these admissions what is Duterte so upset about when the NYT publishes an opinion piece saying "This is a man who must be stopped?" 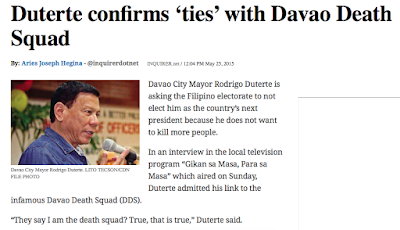 Why is Duterte so upset when people accuse him of being connected to the Davao Death Squad or for killing people when he has admitted both these facts? The New York Times is wrong. The world does not need to condemn Duterte.